Anyway, I digress! I wasn't sure whether I wanted to post this manicure because I still don't know how I feel about it, but as a friend so kindly reminded me when I whined to her, I did learn a few things from the experience. So, I think that alone makes this worth sharing. Thanks, L! The idea for this look came from a somewhat random place: I was driving home from work one day and saw a Mini Cooper painted this way. I was really drawn to the color combo and the off-center stripes, and I knew I had just the right colors in my polish stash, so I decided to go ahead and recreate the paint job on my nails that very evening. The formula for My Vampire Is Buff is super unfriendly. I know it's a staple base color among nail art bloggers, and I can understand why from a color standpoint because it's lovely shade, but I got beyond frustrated trying to actually apply this polish. The formula was very streaky and hard to work with, and if I didn't wait a nice long while between coats (of which there are four here, by the way), I had tons of pulling and bald spots. Using super quick-dry polish over striping tape is not the best idea. I have lots of blacks, but I hadn't used this Rimmel polish yet, so I pulled that one out on a whim for the stripes. Everything turned out mostly okay after some very careful cleanup with a little nail art brush, but the polish just dried so fast that even when pulling the tape off as quickly as I could, I got some lifting and little threads of black paint happening. Not fun. Ditto for quick-dry polishes and dotting tools. Lots of folks probably have no problems with this, but I think I just need a little more time to line up my dots, make sure my hand is steady, etc. Very thin coats of matte top coats are best. I used too much on a few nails (and probably didn't wait quite long enough for the color underneath to dry completely, oops), and earned some bubbling under the surface for my trouble. In addition to all that, I had My Vampire Is Buff + the dots on my index and ring fingers at first, but I ultimately decided that it looked strange and went with black on two nails instead. I think that's just me being fussy, though. Anyway, I think that's it! If you have any thoughts about this look, I'd definitely be interested in hearing them. I'm also curious if there are any products that most bloggers seem to adore that just don't work for you (like My Vampire Is Buff & me)? Thanks for sharing your thoughts on MVIB... I was thinking of getting it since it's such a lovely cream color but I'm not very patient with applying polish... this polish definitely would have made me frustrated! I also had the same issue with polishes drying too quickly when I was trying to create dots so I feel your pain... But that black polish should work really well for a sugar spun mani then! :) cute mani! Thank you! Yes, I really love the color of MVIB... which probably means after some time has gone by and I've mostly forgotten about how frustrated I was, I'll end up trying to use it again when I'm really needing that shade, sigh. :) Great idea about the sugar spun mani, though! 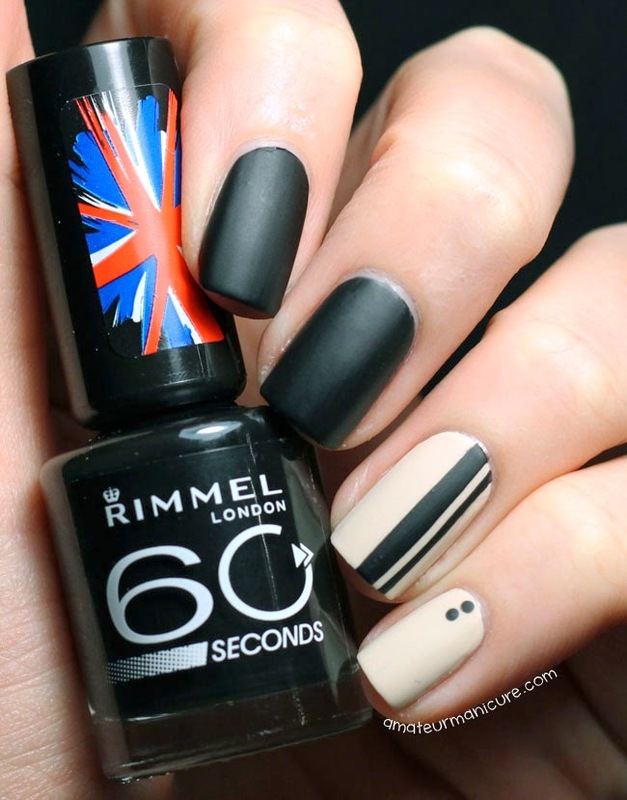 I have the Rimmel polish in a couple other colors, too, so I just might have to try that.